Rush is a progressive rock band which formed in Willowdale, Ontario, Canada in 1968. The band currently performs with the lineup of Geddy Lee (vocals, bass, keyboards), Alex Lifeson (guitar) and Neil Peart (drums). John Rutsey was the original drummer, later replaced by Neil Peart in 1974, shortly after the release of their first album, and three weeks before their first American tour. Neil Peart also became the band's lyricist, and wrote the words for many of the band's best known songs. As a group, Rush possesses 24 gold records and 14 platinum (3 multi-platinum) records. According to the RIAA, Rush's sales statistics place them third behind The Beatles and The Rolling Stones for the most consecutive gold or platinum albums by a rock band. Rush also ranks 78th in U.S. album sales with 25 million units. Although total worldwide album sales are not calculated by any single entity, as of 2004 several industry sources estimated Rush's total worldwide album sales at over 40 million units. In 1974, after the release of their self-titled debut, Neil Peart took over for John Rutsey and soon proved to be not only an amazing drummer, but also an excellent lyricist. His often epic compositions fit perfectly with the band's playing. 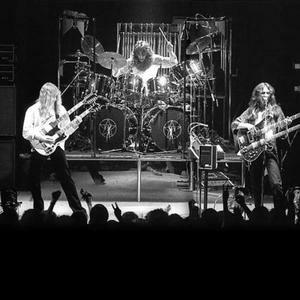 From their metal-edged, more classic rock type material of the early- to mid-70s, Rush were on their way to the top. It wasn't until their late-70's/early-80s material that the band broke through. Rush's 80's output was unlike anything else anyone had produced back then, but still managed to do well. In the 90's, Rush very suddenly changed styles with the release of Counterparts, focusing on a more modern type of rock that was becoming popular right around that time. Most of the albums became similar to hard rock, and arena rock. However, Rush never lost their signature sound, setting them apart from all other bands. While they have not had many radio hits, few hard rock fans have not heard of the band's bigger hits like "Working Man", "The Spirit of Radio", "Limelight" and of course the enigmatic "Tom Sawyer", which catapulted the band into the limelight in 1981. Rush's latest album was released on May 1st, 2007, Snakes & Arrows. Its first single was "Far Cry". The single aired on radios and released on the internet on March 12th. The trio began touring to support the album on an international schedule on June 13, 2007. Rush released two new songs ("Caravan" and "BU2B") on June 1, 2010. In the digital booklet provided on iTunes, they are said to be parts One and Two of "Clockwork Angels", a work in progress. In 2012 Rush finally released album "Clockwork Angels" and on 7th of September started 1st part of their Clockwork Angels Tour (official dates : September 7 - December 2 2012; May 22, 2013 - June 10, 2013).